Stems: Erect flowering stalk, leafless, unbranched, glabrous or glandular-hairy in the inflorescence. Leaves: Simple, in basal rosette; ovate, spatulate, oblong, or oblanceolate, 2.5 to 8 inches long, 1 to 3 inches wide above middle, base usually reddish; margins entire or with hard points; tip blunt to rounded; blade tapering into stalk. Inflorescences: Umbel, terminal; flowers few to many or sometimes solitary; bracts triangular to lanceolate, to 2/5 inch long, pointed, in whorl. Flowers: Very showy, erect in bud, nodding in flower and 1.2 to 2.8 inches long; stalk slender; calyx tube short, bell-shaped, deeply 5-lobed, 1/10 to 1/6 inch long; corolla tube very short, throat thickened, maroon, yellow above; corolla lobes 5, oblong-elliptic, to 1/2 inch long, 2/5 inch wide, magenta, lavender, pink, or white, strongly reflexed; stamens usually 5, anthers linear-lanceolate, 1/4 to 2/5 inch long, free or united into tube, forming conspicuous cone, bases yellow, upper purple, dark maroon or black. Fruits: Capsule, egg-shaped to cylindric, 1/3 to 3/4 inch long, dark reddish-brown; seeds many, spherical or egg-shaped, 1/10 inch long. Habitat: Moist or dry prairies, woods, and rocky bluffs; on slopes or in low ground; calcareous clay soil. Uses: Cultivated as an ornamental. Comments: Common name possibly refers to the comet-like appearance of the flower, i.e. a head and trailing tail. 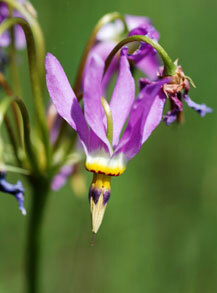 Another legend espouses that falling stars become these wildflowers. Named for English physician Richard Mead, 1673-1754. Members of this genus release pollen when visiting bees vibrate their thoracic flight muscles at a particular frequency which in turn causes the anthers to vibrate.